Travis Ling: My uncle bought a brand new Tissot watch in 1969 before he left Hong Kong for college (and for good) in the States. 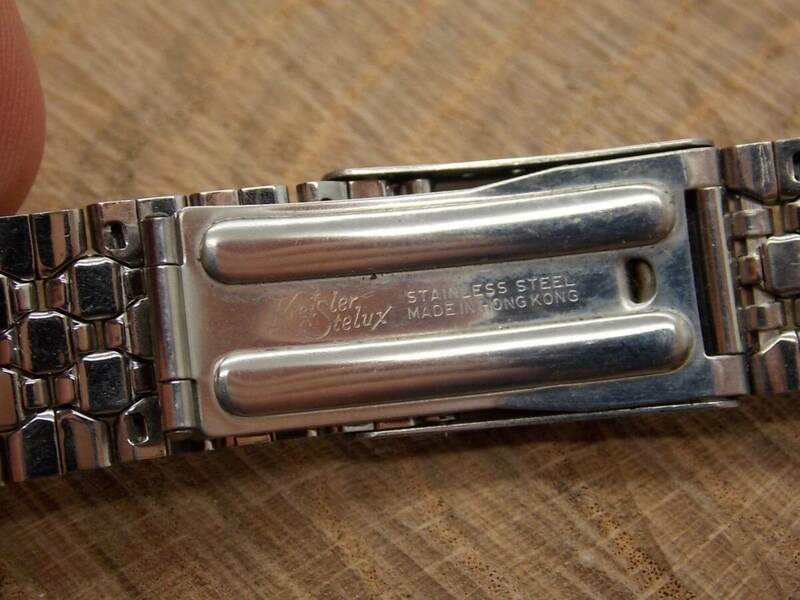 The watch still has its original stainless steel band, marked “Kreisler Stelux Stainless Steel Made in Hong Kong” on the clasp , as shown below. I researched “Kreisler Stelux”and found that it was a popular brand of watch band used by a number of Swiss watches in the 60s-70s; including Bulova, Zodiac and Tissot. Kreisler Stelux also sell watch bands under it’s brand as accessories. Kreisler, which at one time claimed to be the world’s largest maker of watch bands, is owned by Jacques Kreisler Manufacturing Corporation. The Stern-Kreisler Jewelry Company was founded in 1914 in New York by Jacques Kreisler & Marcus Stern. In 1928 Tobias Stern (Marcus’ son) and Jacques Kreisler formed the Kreisler Manufacturing Corporation. In 1948 Kreisler expanded its product line to include men’s and women’s jewellery. In 1952 the men’s and ladies jewellery line was discontinued. The Stelux company website says: “Established in Hong Kong in 1963, the Stelux Group started business initially as a watch component manufacturer exporting stainless steel watch components overseas. Nearly a decade later in 1972, Stelux was listed on the Hong Kong Stock Exchange (Stock Code: 84). The name “STELUX” has its origins in the words “steel” and “luxury”, as in the early 1960’s, the stainless steel components manufactured by the Group were considered luxury products. Since then, Stelux has transformed itself, and is now widely recognised as a leading player in the watch and optical retail and wholesale sectors. The brands operated by the Group, including, City Chain, Optical 88 and Seiko are instantly recognisable and well entrenched in the countries and territories where we operate. Stelux was founded by Wong Chue Meng 黃子明 who went to Thailand at the age of 26 and founded the Thongsia company, selling watches in Thailand. He returned from Thailand in the 1960s and founded Stelux. There are three buildings in the University of Hong Kong named after Mr. Wong, namely Wong Chue Meng Building, Wong Chuang Lai Wah Building and the Meng Wah Complex. This article was first posted on 1st February 2017. I have a watch given to me in the 1970’s by Mr Wongs daughter.I wear it every day, it’s automatic, but at the moment I’m having trouble with it.It seems a part is broken and the watchmaker here in London cannot get a part for it. It is similar to a Rolex design and is a Solvil Titus.Any ideas as to where I can get it repaired.